Somewhere among those results are products made by Apple. On November 9th, 2018, Amazon announced that it would start carrying Apple products. 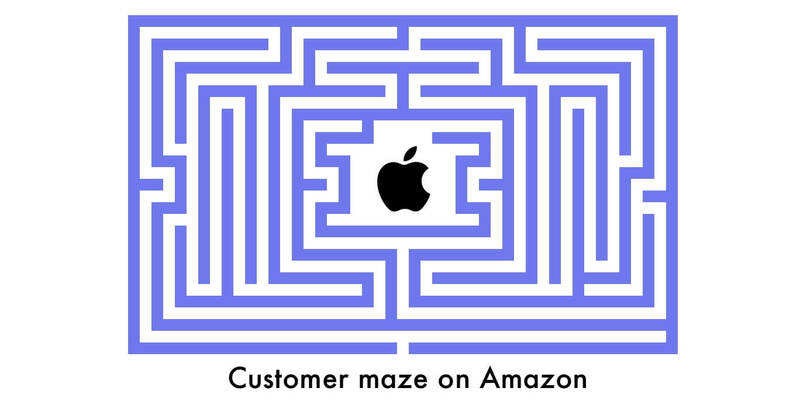 Amazon has sold Apple products before, but those have been from third-party sellers. 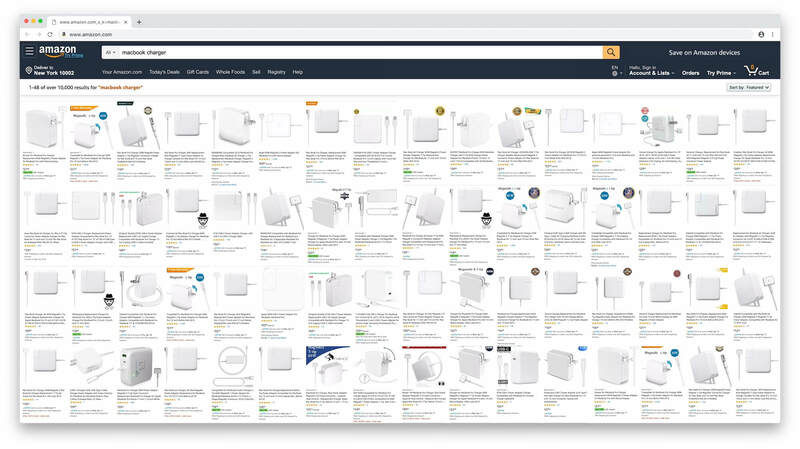 Authentic Apple products are now available on and sold by Amazon; however, they are buried underneath thousands of lookalike copies. For example, shoppers looking for a replacement Apple MacBook laptop computer charger know reasonably well what they want - the same one they had before. However, on Amazon, they get presented with limitless choices with what looks to be the same product. Apple makes nine different MacBook chargers - three power output variants for each version of the charging port. Each is available on Amazon, but despite the agreement between Apple and Amazon in November last year, some consumers are still complaining about receiving counterfeit low-quality items instead. The deal in large part was to prevent third-party sellers from selling Apple products on Amazon and thus avoid counterfeits, but it hasn’t worked yet. 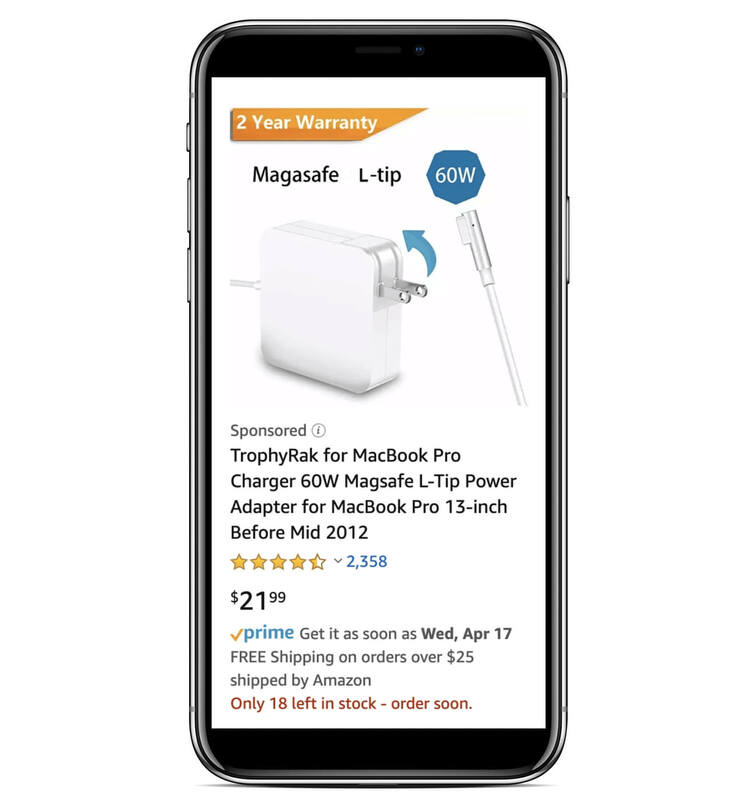 Nor has the relationship produced enough care to improve the product listing - the genuine MacBook charger’s page has one picture, no description, and no enhanced brand content (EBC). Nothing about the product page signifies that this specific listing is for a genuine Apple product. If the shopper is instead looking for a cheaper alternative to the genuine Apple charger, they get to pick out of one of the many look-alike items. Many of which are suffering from the same issues plaguing Amazon as a whole: fake reviews, unverified reviews, merged listings to inherit unrelated reviews, sponsored listings to boost fake listings, and more. Although, many of those items have better product listing pages than the genuine Apple charger. The obvious pick is a charger by TrophyRak brand since it has 2,358 reviews rating the product 4.6 out of 5 stars and comes with Prime. It’s a sponsored product; thus it appears first in search results. However, all of its reviews are fake. Also, unsurprisingly, TrophyRak brand doesn’t exist outside of Amazon, and neither will the charger once enough customers complain. Nonetheless, then there will be plenty more to choose. All of this renders the shopping experience a likely disappointment. Buying a genuine product - if it can be found in the endless list - sometimes still results in a counterfeit delivered. Buying a cheaper alternative is swayed by fake reviews, selling a low-quality item as a five-star rated bargain. There is no way to do this right. Unreliable reviews and ratings, endless short-lived “brands,” as well as the risk of counterfeits, feed information asymmetry that creates the famous Akerlof-ian lemon problem - in which good products are underpriced to compensate for the risk of customers unwittingly buying lemons. In American slang, a “lemon” is a car that is found to be defective only after it has been bought. Customers have learned to offset the risk by looking for lowest priced items, and overall Amazon’s customer service together with FBA and Prime are making it manageable. “Nobody wants to go through 10,000 iPhones. Show me the four best options,” said Devin Wenig, CEO of eBay. It’s a challenge eBay hasn’t solved (it shows more than 80,000 results for “iPhone”), and nor has Amazon. Not only is the shopper left to pick the best option, often influenced by fake reviews, they also can’t trust genuine listings since sometimes those deliver counterfeit items. Fundamentally any retailer is there to curate selection and do quality control. Amazon’s “everything store” is an infinite retailer which tries to achieve that through data and automation. The number of Prime members and the ease of returns is allowing many shoppers to tolerate bad experiences, but the biggest challenge for Amazon for decades to come is making the marketplace customer-obsessed. Today, in some categories even increasingly, it is abuse-obsessed.